After our countless glasses of wine and shots of an unknown alcohol called "Williams" we weren't feeling our best when we got up this morning to join Ingrid and Yves for breakfast. They fed us homemade seeded bread with jam and honey and cups of their Swiss coffee. All throughout breakfast and then several hours into the morning, Ingrid and I sat around the computer, planning our route in Switzerland. They toured Switzerland by bicycle (Ingrid's home country) in 2008, and were eager to show us the best roads and things to see, from the Emmenthal cheesery to the resort town of St. Moritz. In addition to helping with our route planning they offered us a few useful books, including Lonely Planet's Cycling Italy! It felt like a very small world when Ingrid told us that Andrew and Friedel had used it during their travels as well. By the time we finished talking about cycle touring we were all hungry again, so we hopped in the car to head in the direction of Roquefort. 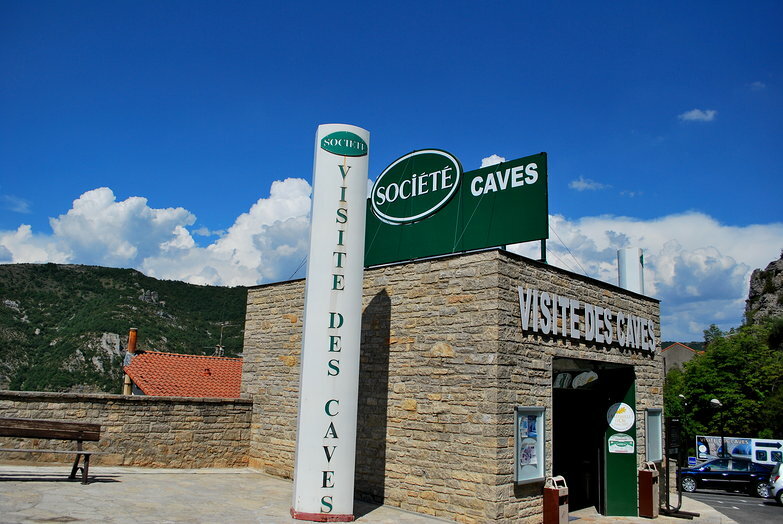 Tara and I were excited to visit the world-famous Société cheese caves located there; Yves and Ingrid were kind enough to take us! The first leg of our trip, though, was a half-hour ride to one of their favorite restaurants, a brightly-colored pizzeria where they would treat us to lunch! By the time we made it to the restaurant I was feeling a little better but Tara was still very woozy. We sat down at a wooden table next to the brightly colored walls, and admired the collection of baskets from around the world that lined them. Looking at a menu, I chose a pizza covered in peppers and sausage while Tara opted for the more adventurous one featuring goat cheese and honey. The heat seems to get to everyone here, even the waitresses moved in slow motion. Despite the speed with which we received it, our food was delicious. We finished the meal with what is becoming our staple dessert, ice cream! With our hunger abated, we felt a little more like ourselves and made it to Roquefort without losing our lunches. Ingrid and Yves had seen the cheese caves numerous times, so they kindly dropped us off and headed to a café while we headed to the cool underground caves. Our Société cheese tour was really quaint and fun, complete with moving dioramas showing the geological creation of the caves, a light show about the Roquefort legend projected on the cave walls, and a corny silent video featuring a very serious man tasting and clearly enjoying his Roquefort cheese. After the movie, we walked down through the various levels of caves, past wheels of cheese covered in foil sheets monitored by cheese experts dressed all in white. It was great to have some refuge from the heat. Unfortunately, the further we went down the more it smelled of moldy feet. The scent was a little overwhelming as we still didn't feel quite ourselves from last night's alcohol and this morning's car ride. As the visit continued on, I was able to pick up little bits and pieces of information, but for the most part the tour moved quickly in French and Tara had very little time to translate. The final part of our visit was the cheese tasting. Honestly, the thought of eating stinky cheese with our stomachs in the state they were in was very unappealing. Nevertheless, we were in Roquefort, and of course we had to try it. It was delicious! As we munched on toothpickfuls of the moldy dairy product, I had time to read the English version of the tour guide's script that Ingrid managed to find for me. Leaving the caves, we were affronted with a wall of hot air. It was hard to imagine a world outside of the cool, dark underground, but here it was, oppressive as ever. A short walk to the café, and we met up with Ingrid and Yves. Then we all made a quick dash to the car where we piled in and headed to the air-conditioned supermarket. Tara and I are going to make them tacos and apple pie tomorrow night! 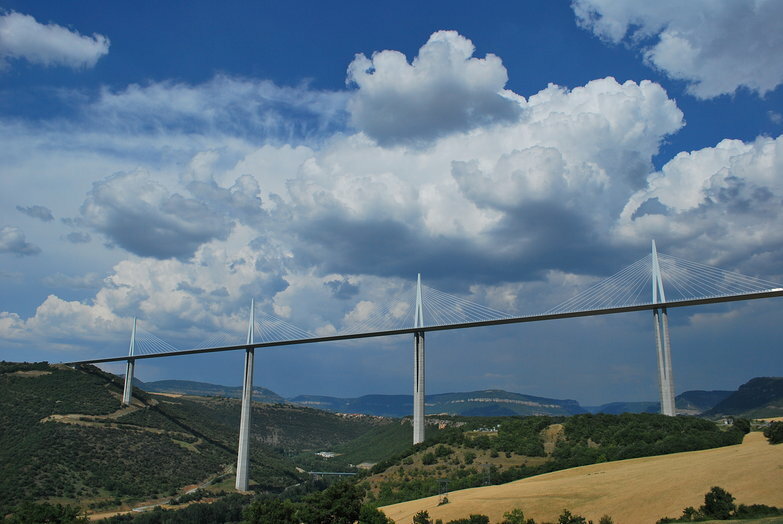 On the way home, after groceries and a cold drink at the attached café, Ingrid drove us to see the Millau Viaduct from a much better vantage point! It really is staggeringly large. Sightseeing complete, we headed home for a relaxing evening. Once more, Yves fired up the grill, this time preparing for us traditional sausages from France and Switzerland for dinner. We stuck to water with our meal, this time! A dessert of unbelievably sweet melon and little cups of ice cream was served under the stars to the din of non-stop conversation with our new friends. When we were through we watched a few more photo albums of their travels before heading contently to bed. So happy to hear that you will be in Italy soon! The carsickness happened to me too, when I was abroad rarely did I ever make it into a car, and when I did there was much pulling over so I could re-gain my ground.